High school students face pressures from school, friends, family and our society in general. A NYU study identified many specific causes as well as some unfavorable outcomes like inadequate sleep and health effects, along with alcohol or substance abuse. The good news is there are some simple, positive ways for students to relieve stress. 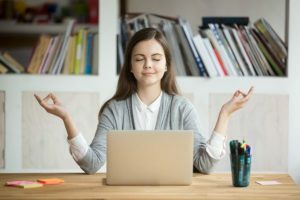 In a recent article, Elizabeth Scott offers ten helpful techniques for students to de-stress. Think positive – optimism works! It’s impossible to remove the pressure from high school students’ lives. There are some fairly simple steps, however, than can reduce the resulting stress and its health consequences. And there is nothing like skill-building to increase students’ confidence and improve their academic performance. Dogwood’s tutors can help your child build study skills, subject skills and testing skills. Call Ivan at 678-735-7555 to discuss his or her specific needs. We’ll be glad to customize a tutoring plan to reduce stress for your whole family.